Floods damaged Lake Isabella park and today they are completing the final restoration process to make it look the way it did before the damage. LAKE ISABELLA, California — Strong flooding caused major damages in Lake Isabella and Thursday morning one of those areas was restored. 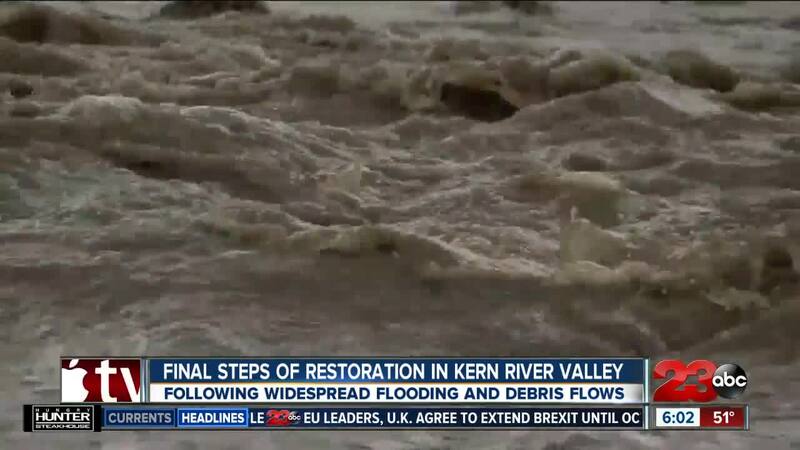 During the first week of March, the Kern River Valley suffered flooding and debris flow damaging many areas. One of those areas was Lake Isabella Park. The location is also known as "Tank Park" and is home to a Military display including USS Arizona memorial. The debris flow went into the display area and caused damage that has been cleaned up by the Kern County Parks Division with assistance from members of the local American Legion. On Thursday at 7 in the morning the first delivery of gravel arrived as the final phase of restoration. All of the gravel was donated by 711 Materials Inc. and spread out by the the American Legion Post 711 members. In January of 2016, The American Legion Post 711 Kern River Valley officially adopted the memorial site via a Kern County Gratuitous Volunteer Agreement. During this period, Post 711 has maintained, repaired and improved the display area.